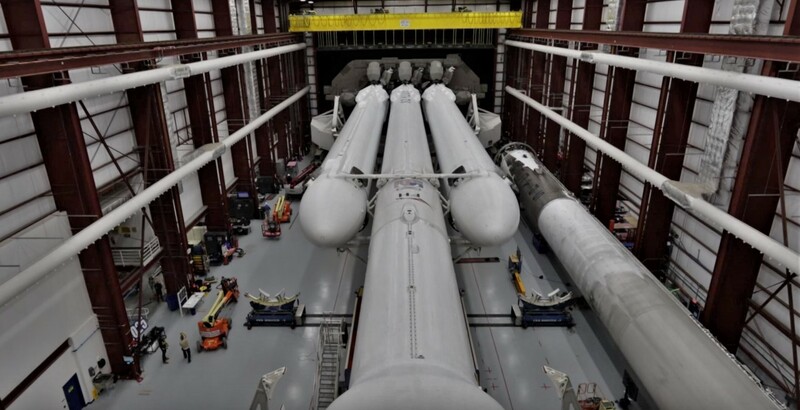 SpaceX is getting ready for the second flight of its Falcon Heavy rocket – currently the most powerful launch vehicle in the world. The launch is intended to place into orbit Arabsat 6A, a large communications satellite for Saudi Arabian corporation Arabsat. Built by Lockheed Martin, the satellite is an advanced commercial communications satellite, designed to provide internet and communications services to residents of the Middle East, Africa and parts of Europe. The flight will not only be the first official commercial launch of the Falcon Heavy – its only other flight thus far being its February 2018 test launch – but the first flight of the Block 5 variant which utilises three core stages of the most powerful version of the Falcon 9 core stage. As is the norm for SpaceX, the massive booster underwent a “static fire test” at the SpaceX launch facilities, Pad 39A at Kennedy Space Centre on Friday, April 5th. These tests involve firing a Falcon vehicle’s main engines briefly at full thrust – all 27 of them in the case of the Falcon Heavy – before shutting them down. The firing allows the start-up and firing procedure for the engines to be tested while measuring pressure, temperature and propellant-flow gradients. The data gathered can then be used to develop a set of criteria unique to the rocket and its engines to help determine whether the vehicle is fit for lift-off in the final stages of a launch count-down, including helping to identify any serious deviation in motor performance which might cause the flight control computers to issue a launch abort. 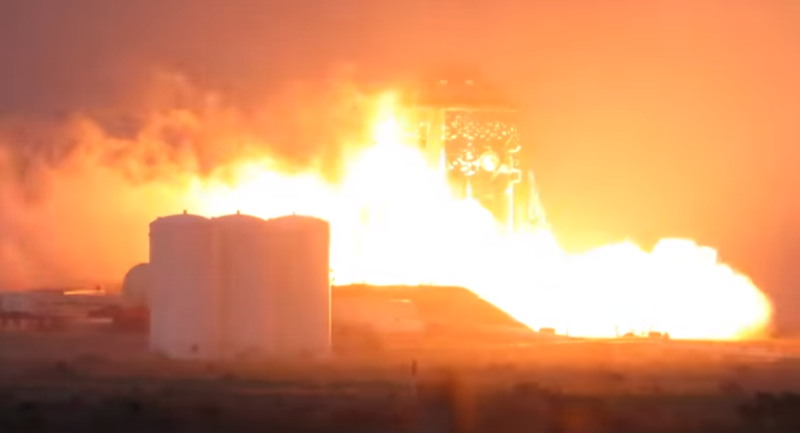 In this case, the static fire test was completed successfully clearing the way for an April 9th launch. However, as this is the first flight of the Block 5 vehicle, Elon Musk has warned it might slip as final check-outs are completed. The Falcon Heavy test came sandwiched between the first two engine tests of the SpaceX Starhopper test vehicle. As noted in my recent Space Sunday updates, this is a test vehicle for SpaceX’s next generation passenger / cargo vehicle the Starship, which SpaceX intends to use in the coming months to examine vertical flight and landing characteristics for the full-sized Starship passenger / cargo vehicle they are developing alongside its massive booster core. The vehicle, constructed at the company’s Boca Chica, South Texas, facility, is currently minus its nose cone, which was destroyed in a January storm. However, one of the three Raptor engines that will power it has been installed, and on April 3rd, with the vehicle tethered to its launch stand, that engine was fired for several seconds – enough to lift the vehicle clear of the pad. A second test was performed on Saturday, April 6th. Again, the motor only fired for a few seconds, but it was enough to lift the lower section of the vehicle to the limits of its securing tethers designed to prevent it entering uncontrolled flight. The vehicle will later perform a series of free flights to test its ability to both take off and land vertically. Once SpaceX has confirmed the vehicle’s flight characteristics, these flights will initially work up to about 500m while later tests will carry it to up to 5,000m. It’s unlikely the vehicle will be fitted with a new conical upper section for these flights, as computer modelling has shown it won’t be required. SpaceX is currently working on a full Starship prototype, which they state will be capable of reaching orbit. Note dates such as rocket launches, are subject to change. Tuesday 9th: second Launch of the SpaceX Falcon Heavy (first launch utilising the Falcon 9 Block 5 first stages), carrying the Arabsat 6A communications satellite. Lift-off will take place from Launch Complex 39A at Kennedy Space Centre, and an attempt will be made to recover all three first stage boosters, with 2 touching down on land, and one at sea on an Autonomous Drone Landing Ship. Thursday 11th: SpaceIL’s Beresheet mission will attempt a historic moon landing. 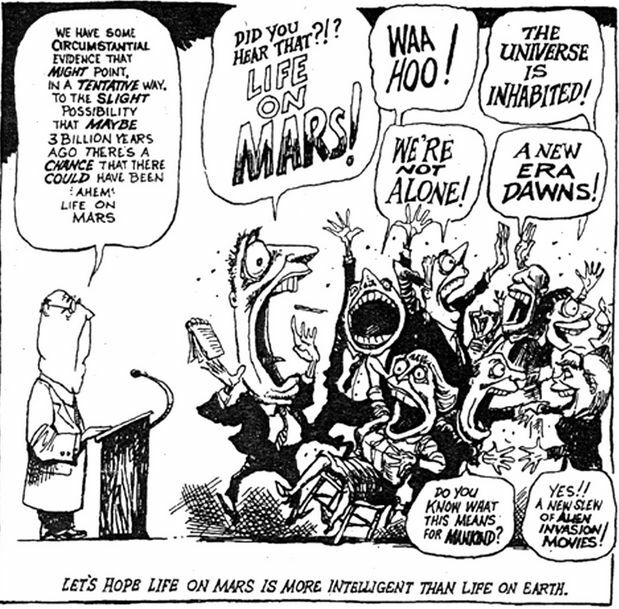 If successful, Israel will become the fourth nation to land a spacecraft on the moon. Saturday 21st / Sunday 22nd: the Lyrid meteor shower peaks overnight. Monday June 17th: “Strawberry Moon”: the “Strawberry full Moon” will reach full phase at 08:31 GMT. Tuesday 2nd: a total solar eclipse will be visible from South America. Friday 5th: NASA astronaut Andrew Morgan, Italian astronaut Luca Parmitano of the European Space Agency, and Russian cosmonaut Aleksandr Skvortsov, the International Space Station Expedition 60 crew, will lift-of Baikonur Cosmodrome in Kazakhstan on a Russian Soyuz rocket. 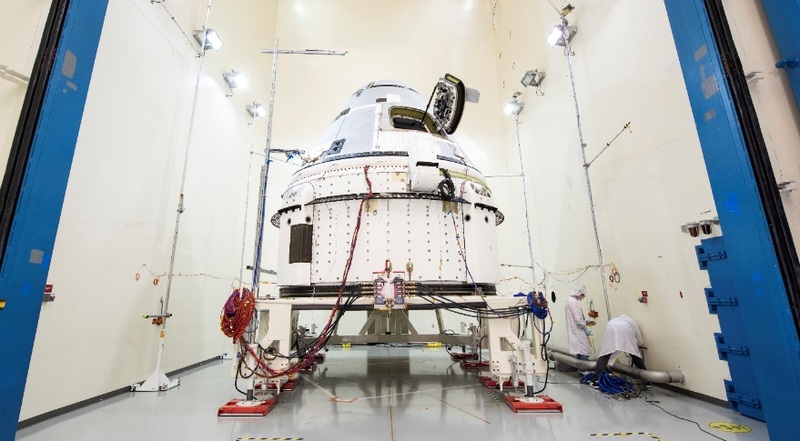 Thursday 25th: SpaceX’s Crew Dragon spacecraft carrying NASA astronauts Doug Hurley and Bob Behnken, will lift-off from Kennedy Space Centre for the International Space Station on the Demo-2 test flight. 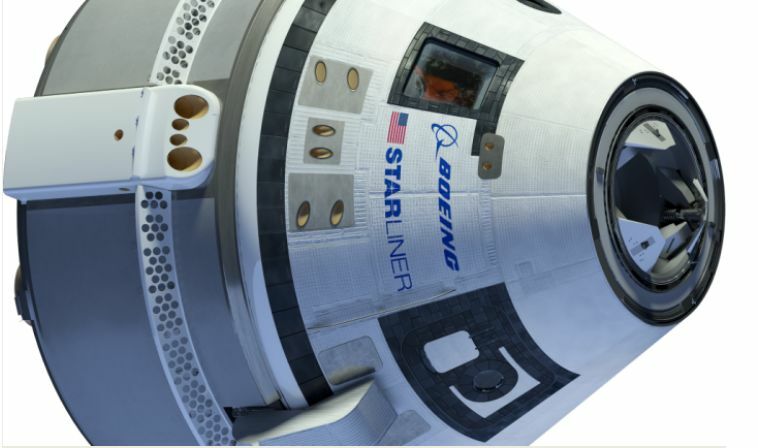 Date TBA: Boeing’s CST-100 Starliner to make its first (delayed) uncrewed flight to the International Space Station. Wednesday 25th: NASA astronaut Chris Cassidy, Russian cosmonaut Oleg Skripochka and Hazza Al Mansouri of the United Arab Emirates will lift-off from the Baikonur Cosmodrome in Kazakhstan on a Russian Soyuz rocket as the Expedition 61 International Space Station crew members. Monday 11th / Tuesday 12th: Mercury transits the Sun. Wednesday 25th / Thursday 26th: An annular solar eclipse will be visible from the Arabian Peninsula to Indonesia. A partial solar eclipse will be visible across much of Asia, the Middle East, Australia and western Africa. The U.S. Air Force’s X-37B space plane will launch on its sixth classified mission atop a United Launch Alliance Atlas V rocket from Cape Canaveral Air Force Station in Florida. Virgin Orbit’s LauncherOne rocket will make its first orbital test flight. India will launch the Chandrayaan-2 mission to the moon. It will lift off from the Satish Dhawan Space Centre in Sriharikota, India. China will launch the Chang’e 5 mission to return samples from the moon. It will be the first lunar sample return mission attempted since 1976.